The drug is also used for prophylaxis against herpes family viruses in immunocompromised patients (such as patients undergoing cancer chemotherapy). The half-life of aciclovir is approximately 2.5-4 hours. It is eliminated renally. Therefore, in order for the medication being effective, it has to be taken every few hours to sustain its concentration in the blood stream. 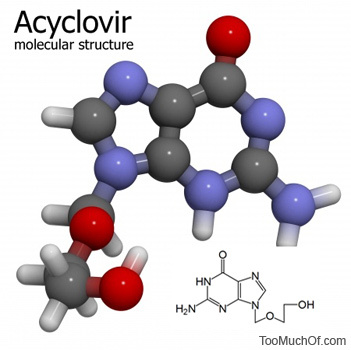 Drug resistance to acyclovir is rare if used short term in aggressive therapy approach. However, in immune-compromised people, continuous use of the drug can lead to development of a viral resistance (viral mutation), significantly decreasing the effectiveness of the agent. Once the drug resistance is developed, it would also reduce the effectiveness of other antiviral drugs such as valaciclovir and famciclovir. The drug’s toxicity should be considered in all patients where any organs have an impaired function, especially liver or kidneys. Many patients report kidney pain with using of acyclovir. If any kidney discomfort continues with usage of the drug, it should be immediately discontinued. If a long term acyclovir administration is warranted, the agent’s blood plasma concentrations should be measured regularly to avoid severe intoxication, especially in patients with renal dysfunctions. When using the drug, it is advised to reduce dietary calcium as it alters calcium metabolism and drink plenty of water to reduce the strain on the kidneys. Acyclovir should only be used as a last measure of the viral control if other methods are not effective. Other methods of viral control are low carbohydrate diet, restoration of the digestive function, particularly protein absorption with protease enzymes, restoration of the intestinal flora particularly with acidophilus probiotics, reduction of stress, staying warm, dietary avoidance of coffee, beverages that contain citric acid, arginine rich foods, and raising body alkalinity with foods and especially with consumption of lemons. Supplementation of L-Lysine amino acid at 250-500mg daily in mornings for a couple of weeks can be helpful. Higher doses of L-Lysine are damaging to kidney functions. Immunomodulatory herbs such as andrographis paniculata can be very helpful short term as well.